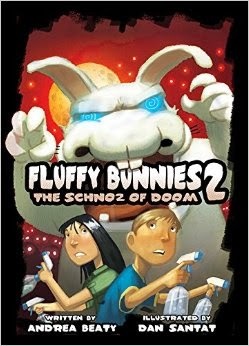 Fluffy Bunnies 2: The Schnoz of Doom is NetGalley review. You can buy this book starting on March 17, 2015. Fluffy Bunnies is about two kids named Joules and Kevin who get abducted by bunny rabbit aliens. In the bunnies' missions, the principal, the gym teacher, and the science teacher are eaten and their forms are taken by the evil fluffy bunnies. It is Kevin and Joules' mission to stop the bunnies. They have different plans--some of them will succeed and some of them will fail. I really liked this book because the bunnies looked cute but they were really evil. I thought that it was weird because they tried to use an old plan against different bunnies but it didn't work out. I like how every time they smelled something stinky, the bunnies got bigger. I really liked the how the pictures were cool and looked like comic-style drawings. Now I want to read the first one too!